Learn how to stain wood, choose the correct finish, and use the right tools along the way. 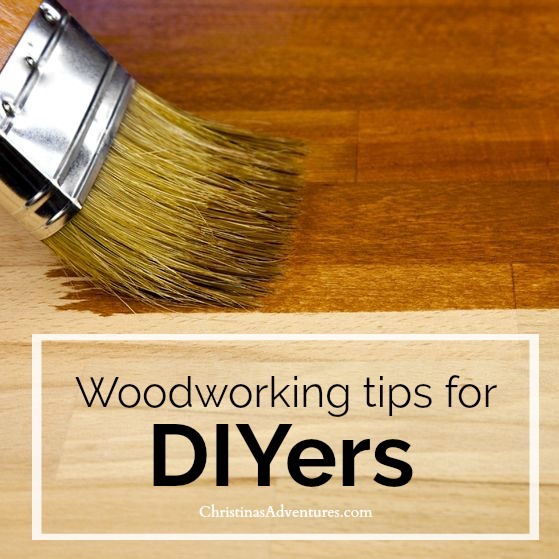 These woodworking tips are for beginning or even expert DIYers alike. This post is sponsored by Minwax. As always, opinions are always 100% my own. 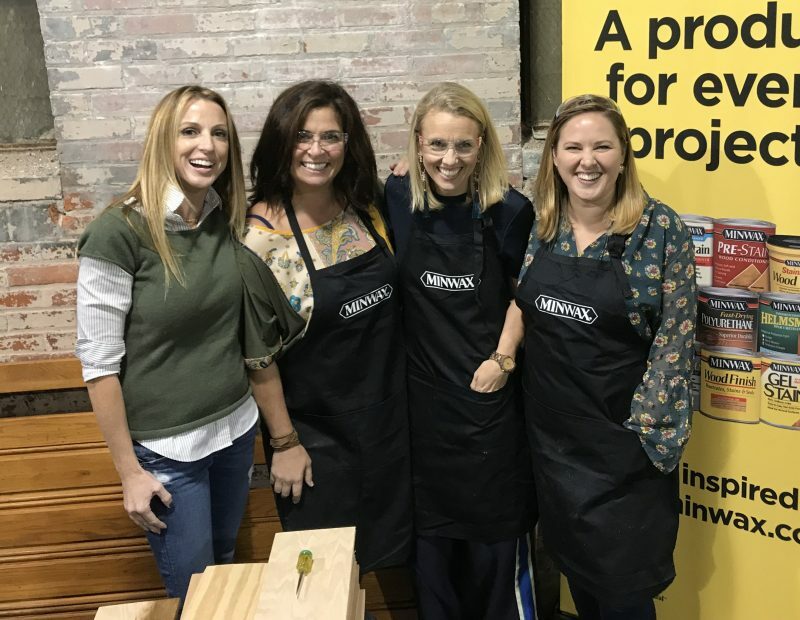 I went to an event hosted by Habitat for Humanity’s ReStore and Minwax a few weeks ago, and it was so much fun! I met some friends, played around with some products, and truly learned just how little I know about staining & finishing wood. I mean, I’ve been DIYing for years now – I wasn’t sure how much I would learn at this wood finishing workshop. I was so wrong! The workshop was taught by Bruce Johnson, who is a wealth of knowledge for all of the things that go into woodworking projects. He blogs here & shares lots of woodworking tips & tricks. If you go against the gran of the wood, you’ll end up with scratch marks once you apply the stain. This one was new to me – and now I won’t do another project without it! 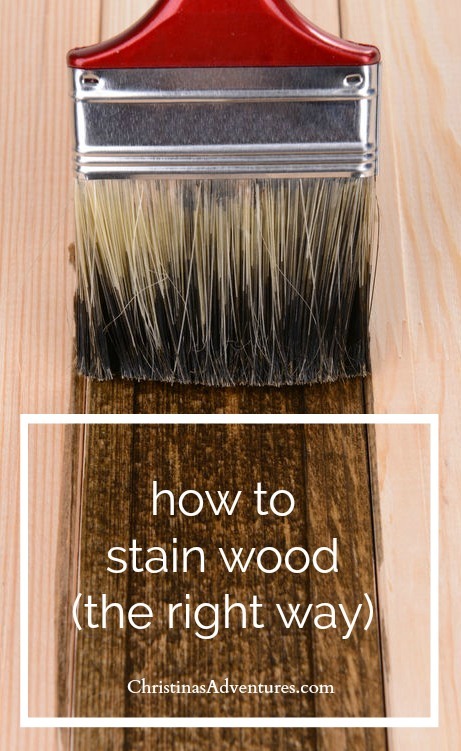 If you don’t condition the wood first, your stain will go on blotchy. Using the right tools is really important for the next two steps. I personally like using oil based stains, but there’s a variety of choices of colors between water based or oil based stains. Oil based products give you a longer working time, while water based products dry quicker. If you use water based products, make sure you are using brushes with synthetic fibers. Otherwise, the bristles will soak up the water and the brush will expand and lose it’s shape. If you use oil based products, you can use a brush with natural fibers or a foam brush. Never shake the stain! It will get bubbles in it and can give you an uneven finish. When applying the stain, make sure you go with the grain. You can wipe off the excess stain after you put the first coat on (the longer you wait to wipe it, the more concentrated the stain color will be). Again, you can choose to use oil based products or water based products. I personally love water based products for this part. Note: water based products dry a lot quicker, so they’re not as suitable for big projects (like floors). You want to be able to give a smooth final coat, and if you have a large space to work with, the water based products may not be able to provide you with enough time. It’s important to apply a finish coat – this will protect your wood from wear & tear, and it will also help lock the stain in and make it even more vibrant. If you’re not a fan of the shiny finishes, you can get them in satin or matte! Don’t let the high gloss finish scare you away if that’s not your style. Polyurethane (which is oil based) will amber, or yellow, over time. 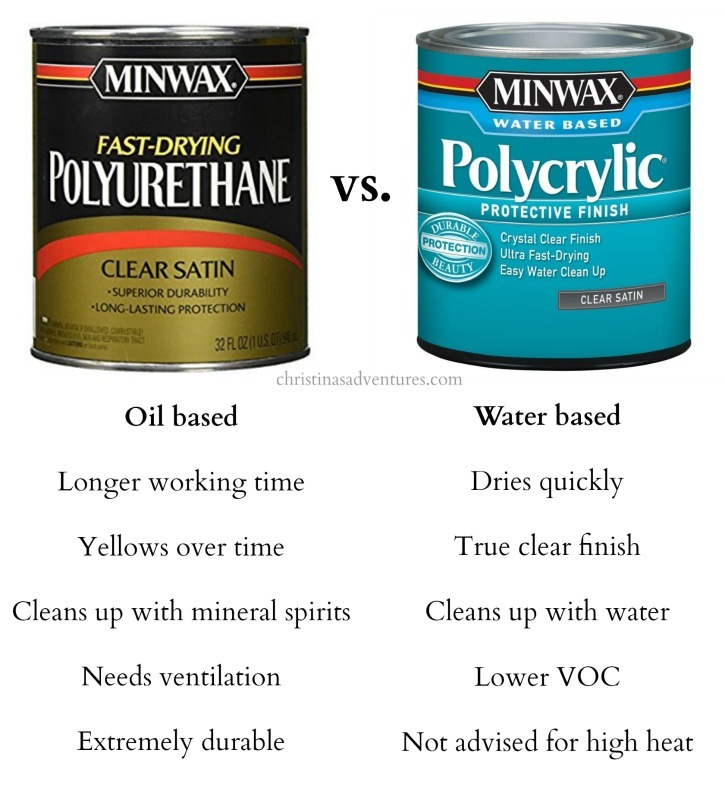 Polycrylic (which is water based) will always be clear and will not yellow. Just remember – you’ll have a longer working time with polyurethane than polycrylic. If you’re confident in your ability to work quickly, then go with polycrylic! Let your stain dry overnight before applying your top coat. Do one thin coat, wait overnight, sand *lightly* with a fine sandpaper, and reapply the finish. Repeat this process at least one more time before you can officially be finished. I’m guilty of throwing my brushes in the refrigerator with a baggie over them at night…but I am sad to report that I was told that wasn’t a good idea. Boooo! Take the extra 5 minutes and thoroughly wash your brush out after every use. If you’re using an oil based product, clean with mineral spirits. If you’re using water based, you can clean with water. Make sure to hold your brush down while cleaning – otherwise product will build up near the base of the brush and ruin the shape of your bristles. You can use the little hole at the end of your handle as a hanger, so you can hang it to dry to keep the shape of the brush. Did you know you could keep that little cover it comes in to protect your brush after use? I always just threw it away – not anymore! OK – phew. I know that’s a lot of information! It’s important to be informed, but it’s also OK to experiment and find your own special technique and style! One of my favorite easy DIY projects – we used Minwax Early American stain on these (look at the difference in tones between that pine wood and the butcher block – we used the same stain!) I love how they look, but this is why it’s important to test a section first before you commit to a stain for your wood. If you liked this post, or found it helpful, please share with others by pinning it! Make sure you head over to Minwax’s Facebook page to “like” them and see lots of other tips & tricks that can help with all of your DIY projects! You can also find a LOT more specific product information on Minwax.com – they’re a great resource! 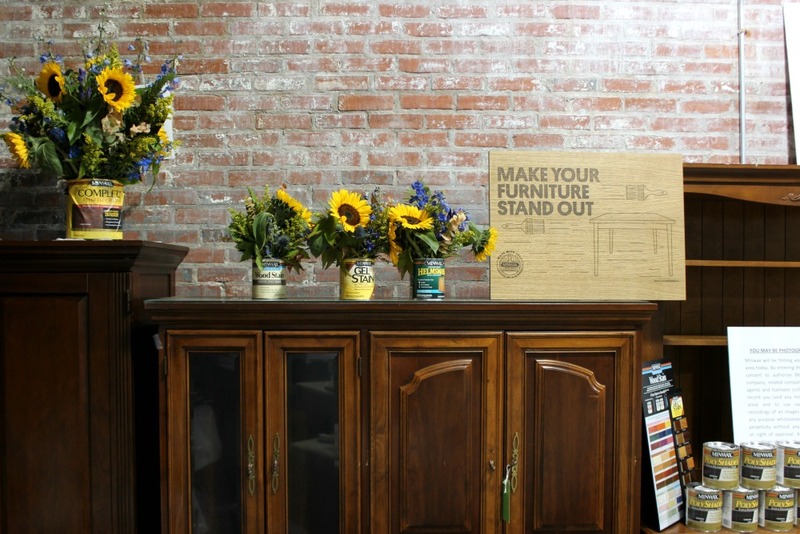 This post and the event I attended where I learned all about how to stain wood are all part of Minwax’s “Made with Love” campaign. Please visit their website for the cutest ideas and inspiration for your next DIY project! They’re working with some amazing friends of mine – see any familiar faces in this group? 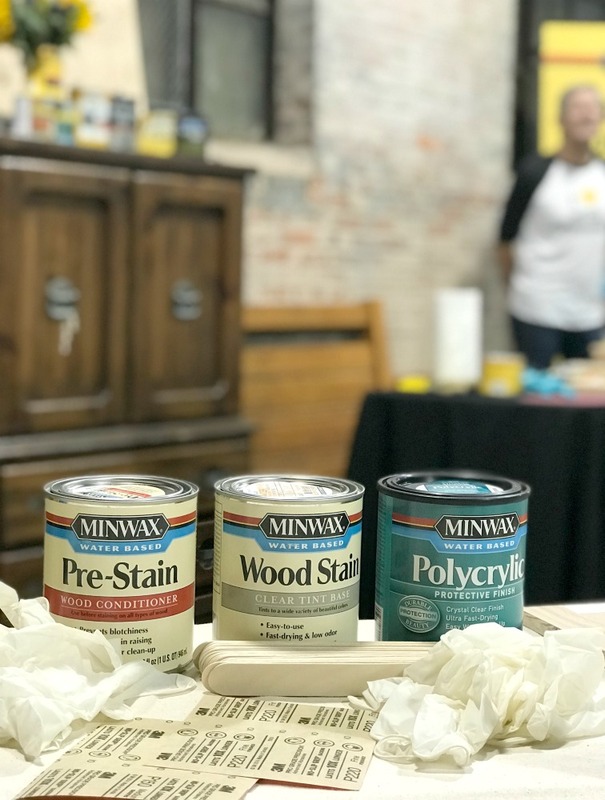 Thanks again to Minwax for sponsoring this post & providing us with great products for all of our DIY needs. Absolutely loved this tutorial and I love minwax! Thanks so much for sharing! Great tips and wonderful projects! I would also recommend using a tack cloth after sanding your finish in between coats. It picks up every tiny little spec of dust so your finish is always nice and smooth. Such a great tutorial and we use Minwax all the time. Thanks for the tips! These are such great tips that I never knew! Thanks for all the helpful info! 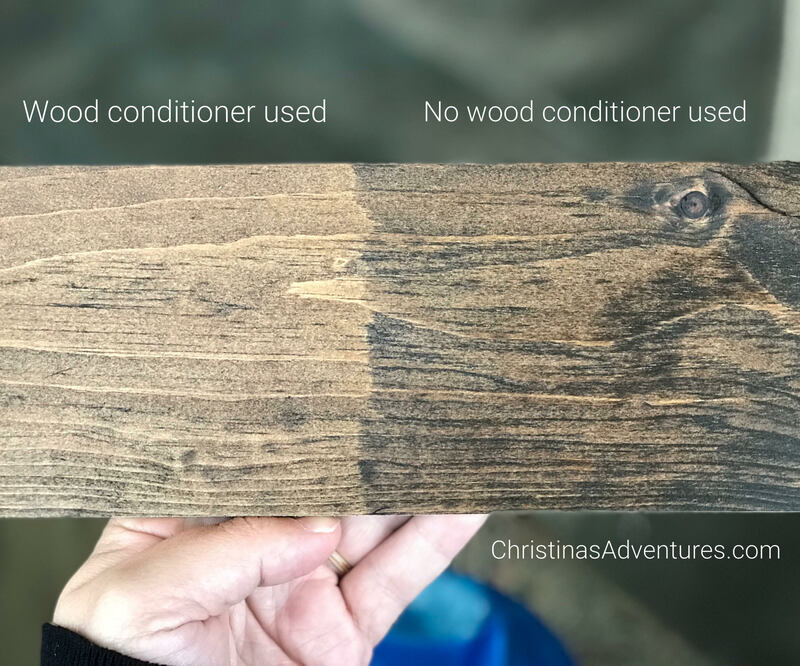 I totally didn’t know about the wood conditioner! Thanks for the tips! Do you apply stain with a brush or rag? Do you wipe off excess with a rag or special cloth? Thanks for sharing this with us! I’m getting ready to stain shelves and no one told me about wood conditioner. I’m curious if you’ve ever used a rag to apply stain? I heard this is the most effective.